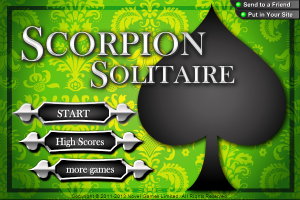 "An easy Solitaire variant to train your skills"
The video game presented here is called Scorpion Solitaire. Solitaire is a famous game that can be addictive. Now, if you’re tired of playing the standard version that comes preinstalled on your Windows system, here on Winportal we provide you a multitude of variants and Scorpion Solitaire is one of them. We won’t go into the details of Scorpion Solitaire’s gameplay, as finding that out is part of the fun for the real Solitaire gamers. Note that Scorpion Solitaire is one of the easy variants, suitable for those among you who’d like to improve their skills to be ready for the more complex and brain-challenging ones. This is a freeware game with an attractive graphical user interface, providing you an opportunity for various hours of solitary fun. So, if you’re ready to find out if you can remove all the cards, proceed to the download.